With over 10,000 WordPress themes available, it’s quite difficult for beginners to find the best WordPress theme for their needs. Often we’re asked by users if there is a single WordPress theme that fits all use-cases. The answer is YES. You can use a popular multi-purpose WordPress theme on just about any kind of website. Having the right theme can make a huge difference in your blog / website growth. In this article, we have hand-picked the best WordPress themes of 2019. Our focus with this article is to highlight the best and most popular WordPress themes in their respective categories. We have niche specific WordPress themes as well as top WordPress multi-purpose themes in this list. Depending on your use case, you can choose the one that best suits your needs. 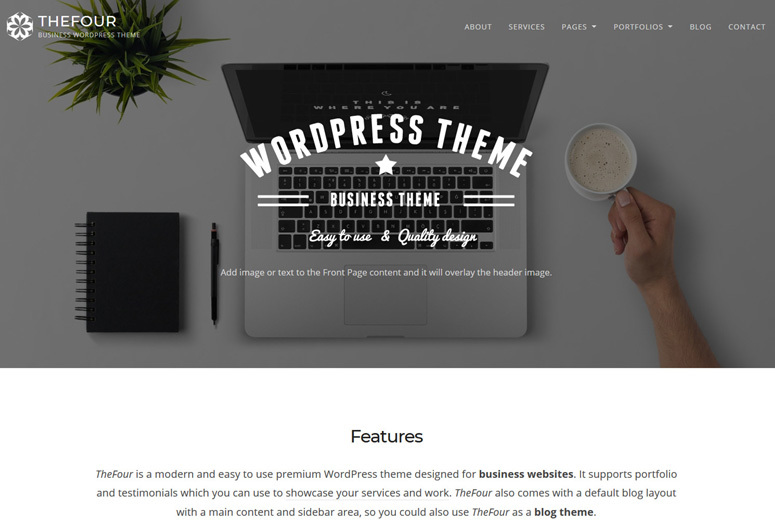 Having said that, let’s take a look at the best WordPress themes on the market. Divi is one of the most popular multi-purpose WordPress themes on the market. It is created by Elegant Themes, one of the leading WordPress theme shops in the world. 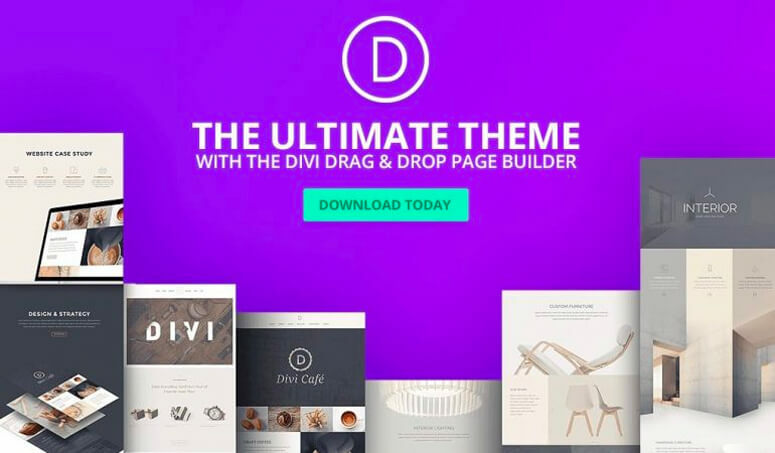 Divi comes with a built-in drag & drop builder that you can use to create any type of layout. You also get 20 pre-made layouts right out of the box that you can use to jump-start your new project. Divi allows you to save your custom layouts in the Divi library, so you can re-use them later as needed. Read the complete Divi review. Get started with Divi today! Ultra is the most powerful and flexible WordPress theme created by Themify. It makes it easy for you to create any type of website with a powerful drag & drop builder. With a single click, you can import their demo setup that includes various theme settings, content, menus, widgets, and more. This helps you quick-start your new website project. It comes with 15 header / page styles, 6 header background options, 6 footer layouts, 5 single post layouts, 6 archive layouts, section scrolling and more. Best of all, you get a library of 60 complete pre-designed layouts with parallax landing pages and other awesome features that are designed by professional designers. You also get 10 bonus addons like progress bar, counter, pricing table, countdown widget, and more. Read the complete Themify Ultra review. Get started with Themify Ultra today! Unlike other products listed here, Beaver Builder is NOT a theme, but a complete page builder plugin that works with any WordPress theme. Beaver Builder is probably the best page builder for WordPress. With Beaver Builder, you can build your website block by block the way you want. This will give you the freedom to use any layout you want. Use multiple layouts for different pages, use your own colors, styles, and content anywhere on your site. The best thing is that it comes with tons of creative page templates to choose from, so building a site is a breeze with Beaver Builder. Read the complete Beaver Builder review. StudioPress is one of the best premium WordPress theme hubs on the market. 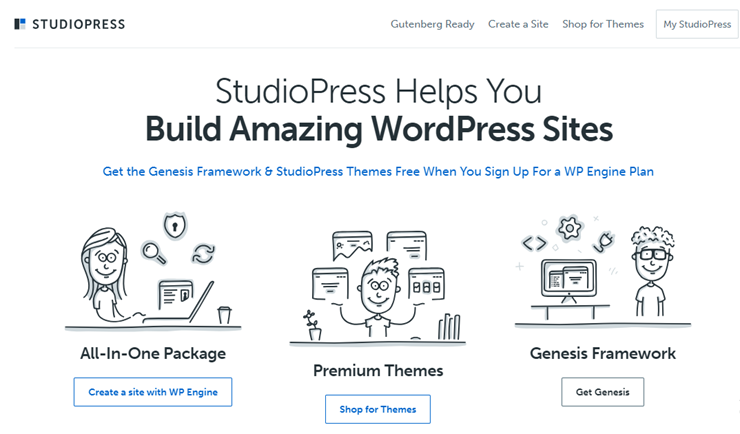 StudioPress themes are built on top of Genesis framework, which works seamlessly with the new WordPress editor, Gutenberg. StudioPress Themes are now part of the WP Engine family, the leading managed WordPress hosting provider. You can either purchase their themes individually or get all themes as a bundle for a one-time payment. Alternatively, you can sign up for a WP Engine hosting plan and get access to all 35+ premium WordPress themes for free. Get started with StudioPress today! 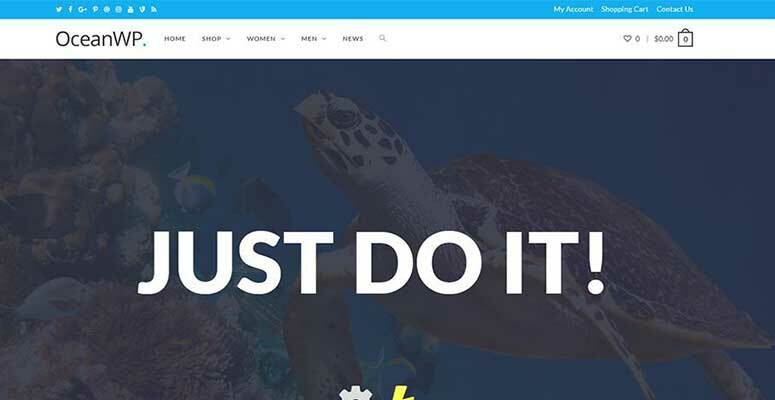 Ocean WP is a light-weight and highly extendable theme that helps you create any types of websites you want. It seamlessly integrates with WooCommerce and supports popular page builders, including Beaver Builder, Elementor, etc. It provides you with custom header layouts, unlimited color options, custom widgets, image sliders, and a featured products section. After all, it’s free to use! Astra is a highly customizable WordPress theme that lets easily build a website the way you want. It comes with a set of demos, which enables you to quickly launch a full-fledged prebuilt site with just a click. After importing the demo, you can customize the look per your preferences. With Astra, you get the ability to turn off the page title & sidebar. It seamlessly integrates with the popular page builders, such as Beaver Builder, Elementor, etc. Get started with Astra today! 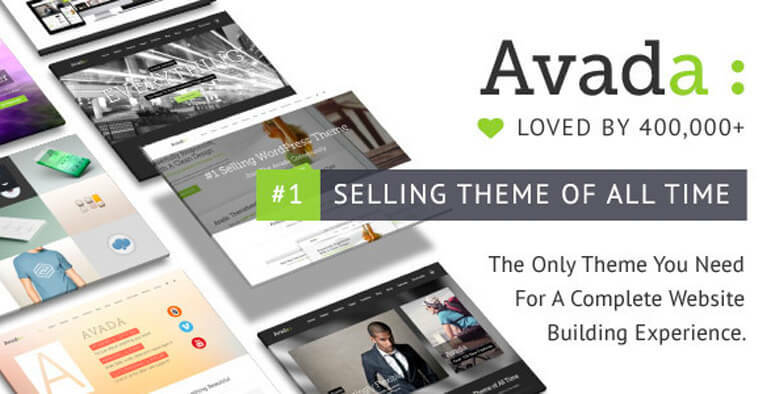 Avada is the #1 selling premium WordPress theme of all-time. It is the original multi-purpose WordPress theme that comes with 255+ pre-made web page designs and 41+ pre-made fully featured websites. Avada was built with a sole purpose of having you get started as fast as you can. Their demo installer makes it very easy to set up pre-made content. You can use their drag & drop builder and 1000s of options to customize your site as needed. It works with all premium WordPress themes. Read the complete Avada review. Get started with Avada today! Hestia is a free and premium WordPress multi-purpose theme for business, magazine, and blog websites. Unlike other themes, Hestia offers a free version as well. Hestia works seamlessly with WooCommerce, so you can use it to create your online store. It also works with all major page builders. It’s translation ready and SEO friendly. It works with the Live WordPress theme customizer. Get started with Hestia today! Similar to Hestia, Sydney also offers both free and premium version of its multi-purpose theme. Sydney is one of the most popular WordPress themes in the free WordPress.org theme repository. It allows you to use extra widgets, live customizer, and pre-made templates to customize your website. Sydney works seamlessly with WooCommerce so you can use it to create an online store. It’s translation ready and works with the live WordPress theme customizer. Read the complete Sydney review. Get started with Sydney today! Shoppe is a multi-purpose WooCommerce theme to help you build professional eCommerce site in minutes. 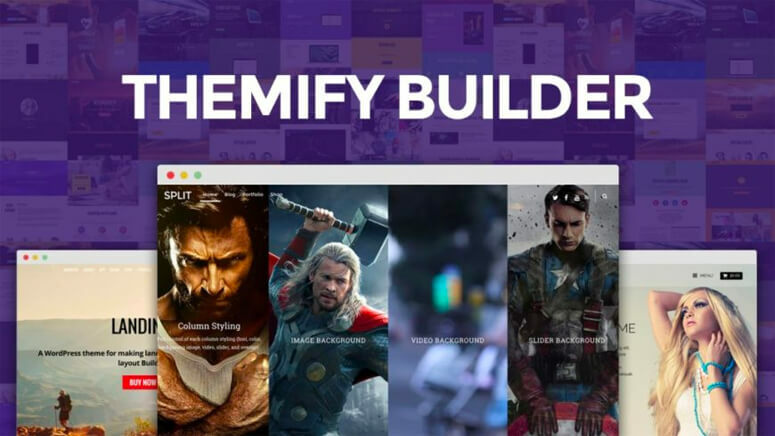 It comes with the drag & drop Themify builder and many eCommerce features like ajax cart, quick look lightbox, quick search, zoom image feature, and more. Shoppe is one of the first multi-purpose themes built specifically for WooCommerce. It comes with over 60+ regular layouts and 20+ shop landing page layouts. Basically, if you’re looking to start an online store, then Shoppe is one of the top theme choices. Get started with Shoppe today! X theme is one of the most loved themes on ThemeForest. It comes with a drag & drop page builder, a template manager, and global blocks that you can use in multiple areas of your design. X comes pre-built with complete website demos and structural layouts that you can use to get started quickly. For example, you can use it to create sites for churches, bands, wedding, food truck, agencies, and more. It’s a complete multi-purpose theme that also bundles a lot of premium plugins as part of the package. Read the complete X theme review. Get started with X theme today! 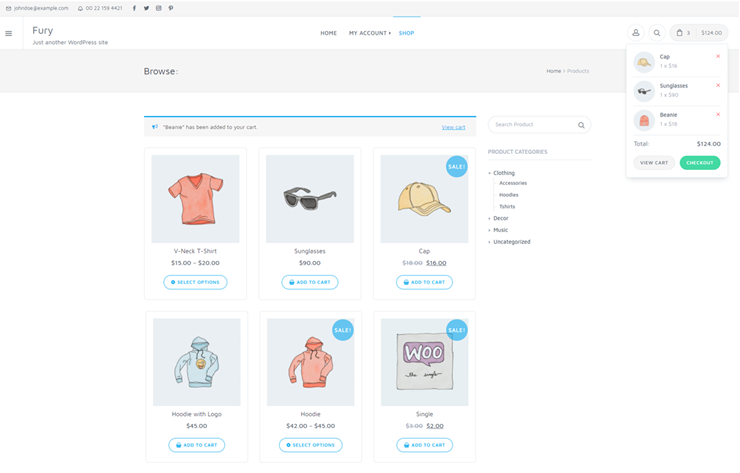 Storefront is the default theme for the popular WooCommerce plugin. It is designed and developed by WooCommerce core development team. It features by far the best integration with WooCommerce and many of the popular WooCommerce extensions. There are several layout and color options that you can use to customize your shop. The best part about Storefront theme is that it’s lean and extensible. Read the complete Storefront review. Get started with Storefront today! Authority Pro is a multi-purpose WordPress theme geared for bloggers, entrepreneurs, and freelancers. It’s built on the powerful Genesis theme framework. It comes with a widgetized homepage layout, customizable header, theme options page, and more. It is also WooCommerce ready and works with several other top WordPress plugins. StudioPress is known to create top-quality themes that are fast and lean. Get started with Authority Pro today! 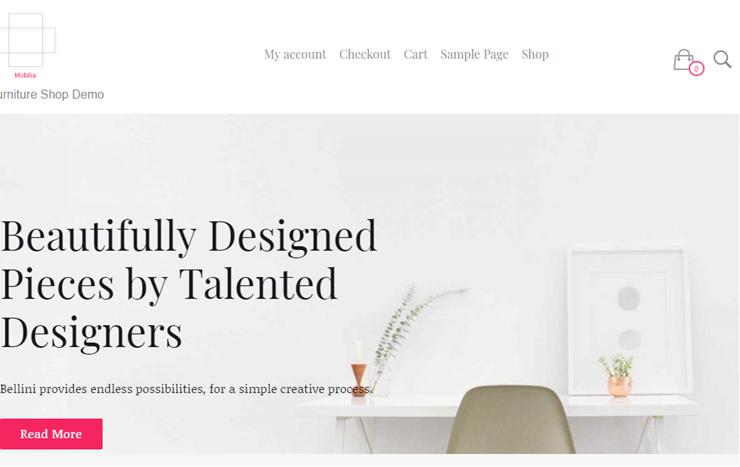 Vogue is a simple, clean and minimal WordPress business theme suitable for entrepreneurs and small agencies. It is available in 2 flavors: both free and premium. Vogue theme comes with a deep level of WooCommerce integration so that you can build an eCommerce website easily. It has custom WooCommerce design options for the shop page. It features 4 header layouts, 4 blog layouts, and 2 footer styles. It allows you to customize the entire theme settings with real-time previews using the WordPress customizer. Get started with Vogue today! Avant is a free and premium multipurpose theme for WordPress. You can build a wide variety of websites ranging from a simple blog to a full-fledged online store using this theme. Avant theme enables you to easily give a unique look to your website. You can choose from 7 stylish header layouts, 5 blog layouts, and 3 footer layouts and make a website of your imagination. The plugin supports the Elementor page builder, WooCommerce, WPForms, and Breadcrumb NavXT. Packed with a bunch of great features, Avant Premium is available for just $29. Get started with Avant today! Conica is yet another powerful multipurpose theme for WordPress. You can use it for creating a wide array of websites including a blog, business website, online store, etc. It comes with several customization options that are easy to manage even for beginner users. The theme provides a number of stunning features that enable you to build a modern website. It features deep WooCommerce integration, header options, homepage sliders, blog list and archive page styles, and more. Conica is, without a doubt, a wonderful theme for all types of websites. Get started with Conica today! 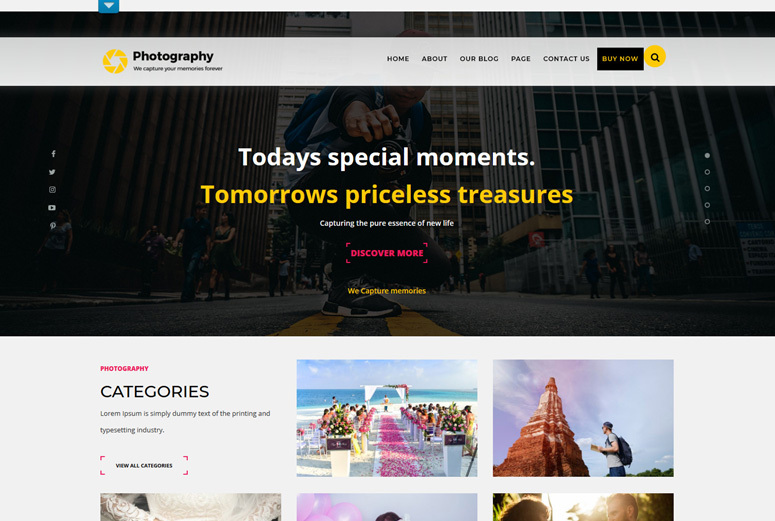 CityLogic is a stunning WordPress theme that allows you to create any website ranging from travel to business, lifestyle and even an online store. 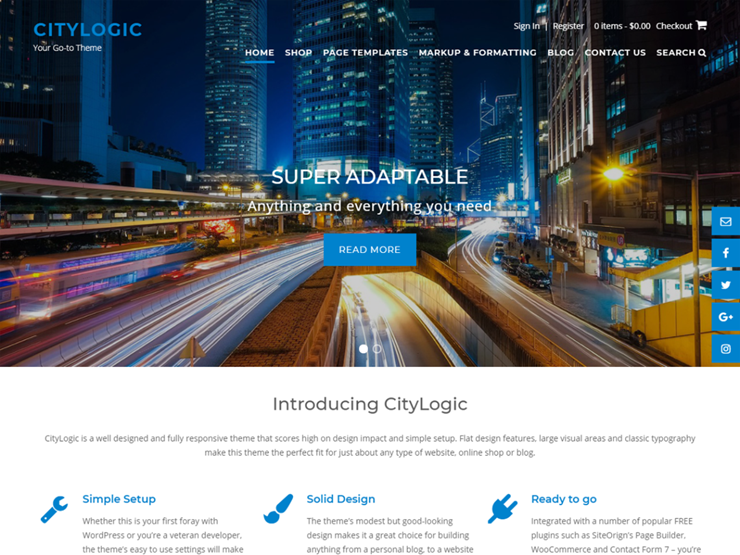 The CityLogic theme is developed by Out the Box, a leading WordPress theme shop. The free WordPress theme comes with all the essential features you’ll need to build a stunning website. CityLogic is compatible with a number of popular plugins such as WooCommerce, WPForms and Elementor, etc. With the premium version of the theme, you can easily turn your site into a one-page website by simply enabling One Page Mode. You also get endless options to customize your WordPress site such as multiple layout options, sticky navigation menu and sticky header, etc. 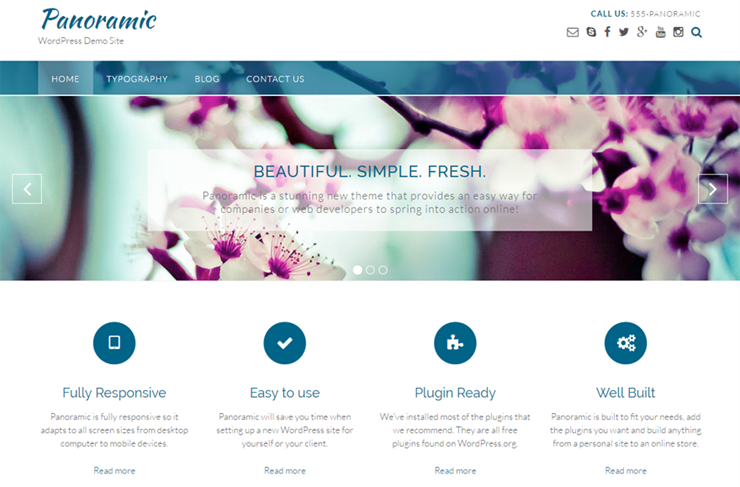 Panoramic is yet another beautiful, responsive WordPress theme by Out the Box. Panoramic lets you add a beautiful homepage slider without having to install any slider plugin. When used in conjunction with SiteOrigin’s drag and drop page builder plugin, even an absolute beginner can quickly build beautiful page layouts. Their extensive documentation helps you walk you through every aspect of building a website with the Panoramic theme. A free version of the theme is available in the WordPress repository. You can purchase the premium version for $25. Get started with Panoramic today! 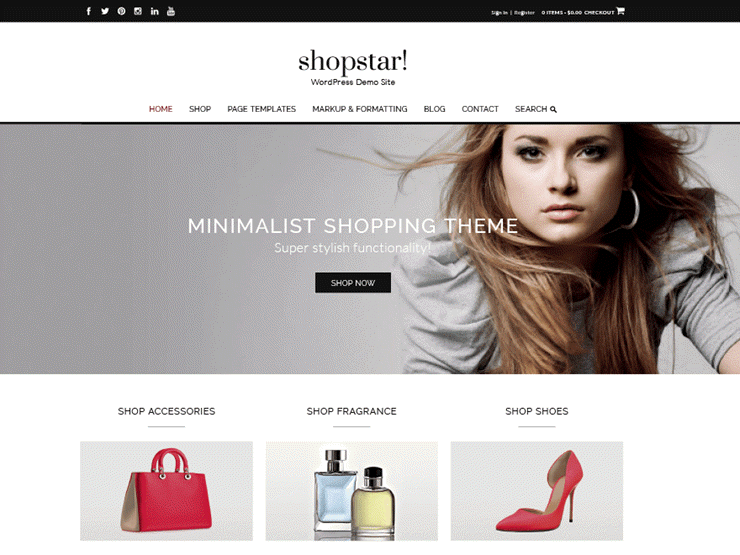 Shopstar is a minimalist shopping theme perfect for building an online store, blog or fashion website. The theme seamlessly integrates with WooCommerce, the best eCommerce platform on the web for WordPress. Shopstar lets your customers quickly preview and add products to the shopping cart as they browse through your store. The theme supports both right and left sidebar. You can even choose a full-width layout for your pages. For your blog page, you can choose between the side layout, top layout or masonry layout. Get started with Shopstar today! 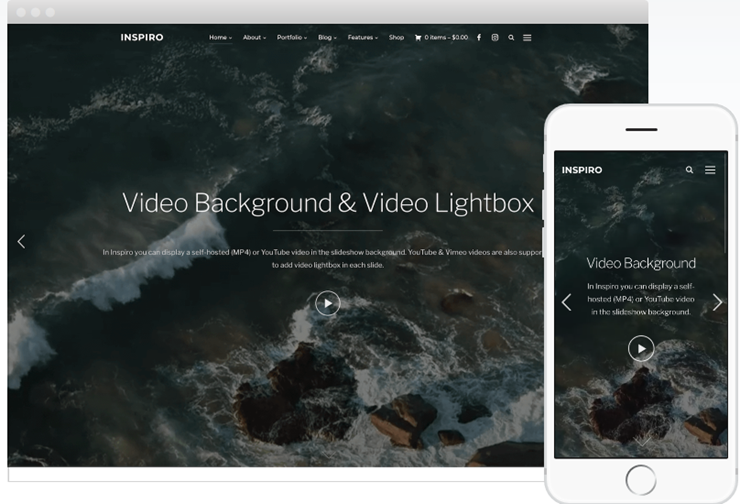 Inspiro is a professional photo and video focused WordPress theme. It lets you publish a full-screen slideshow in your background that supports YouTube and self-hosted videos. The theme integrates seamlessly with WooCommerce to provide a solid platform to build your online business. Its advanced options panel lets you easily customize every detail of your WordPress theme. If you want to show off your portfolio with images and videos, then Inspiro might the best choice for you. Get started with Inspiro today! 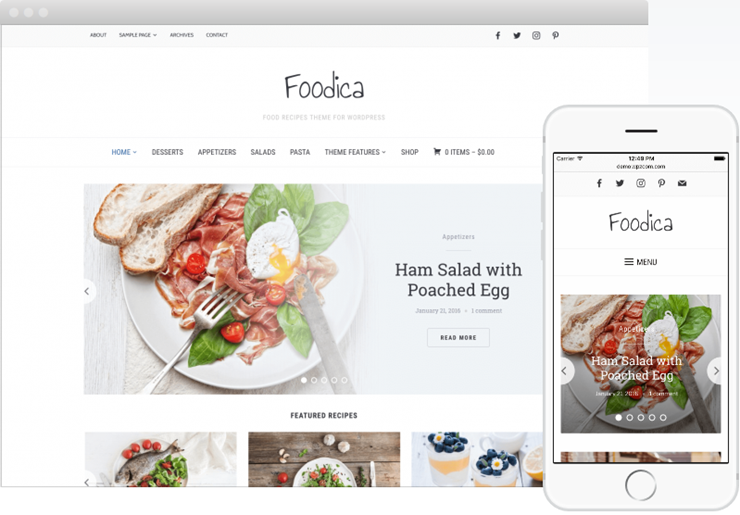 Foodica is one of the best WordPress themes for creating food based blogs, magazines and recipe websites. Foodica is an AdSense-ready WordPress theme. It includes multiple banner locations that allow publishers to easily upload ad banners for monetizing their website. The theme comes with 1-click demo content install, so you can quickly build a website similar to the demo website. The theme also offers 6 color schemes and is bundled with visual customizer that lets you easily choose the right color combination that perfectly matches your brand. Get started with Foodica today! Fury is a free multi-purpose WordPress theme that you can download from the WordPress themes repository. The Fury theme is best suited for creating an online store. Its sticky navigation bar remains at the top of your WordPress site even when you scroll down the page. In the right hand corner of the navigation bar, you can find the My Account menu, search box, and the cart button. This provides a seamless shopping experience to your customers. The flexible theme customizer panel lets you easily tweak every aspect of your WordPress website. The theme also supports several custom layouts for pages and blog layouts for single posts. Get started with Fury today! 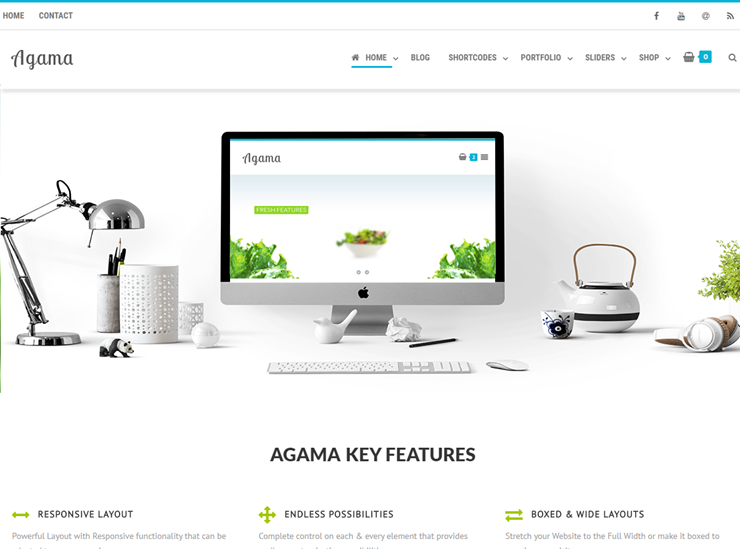 Agama is yet another free WordPress multi-purpose theme that you can download from the WordPress theme directory. Agama is built on Bootstrap with parallax support. As your visitors scroll down, the parallax scrolling moves the background content at a different speed than that of foreground content. If you’re looking for a multi-purpose theme with the parallax scrolling effect, then Agama is the best fit for your needs. Get started with Agama today! Ascend is a free WordPress multi-purpose theme by Kadence Themes. It comes bundled with 4 different demo designs that you can easily import into your website. Ascend also lets you create stunning galleries on your website without having to use any WordPress gallery plugin. It supports 3 different gallery styles: normal, no-margin and post style. Ascend is a Gutenberg compatible theme, meaning you can create as rich a post layout as you can imagine with the famous Gutenberg plugin. Get started with Ascend today! 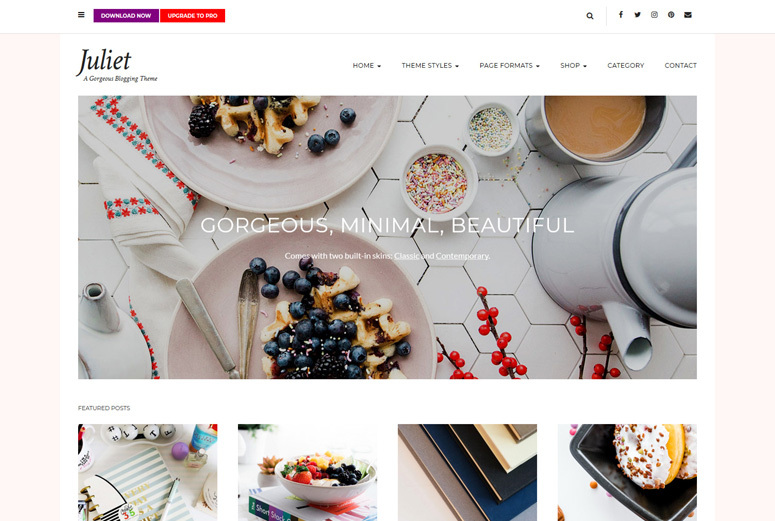 Plum is a free multi-purpose theme by InkHive. With over 30,000 satisfied customers and 2 million downloads, InHive is one of the most reliable WordPress theme hubs. Plum comes with all the essential features you’ll need to build a stunning website with ease, such as responsive & mobile friendly, retina & 4k ready, multilingual & WooCommerce support, and so on. It lets you easily add a slider to your homepage and publish an amazing gallery page to showcase your portfolio. All your theme options can be adjusted from the Customizer panel. Get started with Plum today! 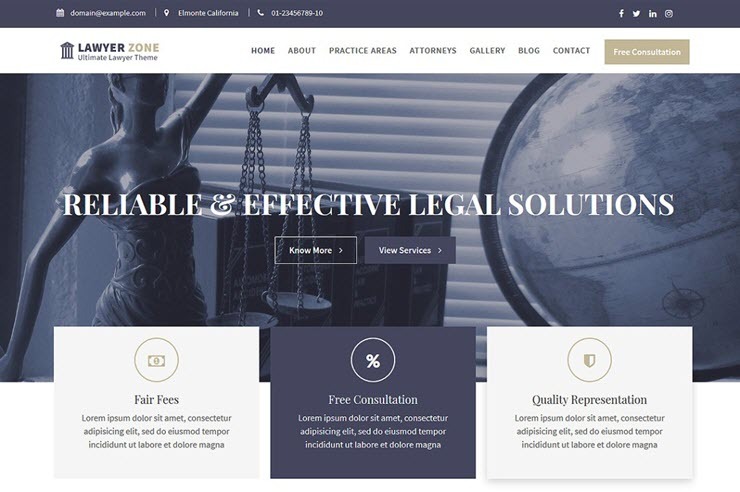 Lawyer Zone is a modern multi-purpose WordPress theme built especially for Law businesses. This theme is developed by Acme Themes. Lawyer Zone is shipped with 9 custom widgets that can be added to your homepage and sidebar. All theme options can be adjusted in the Customizer panel, so you can make changes to your theme with live previews. Slider: Create beautiful sliders on any page with unlimited slides. Header and footer options: Easily customize your header and footer with multiple options in the theme customizer. Layout controls: You can set your sidebar on left, right or even choose a full-width sidebar. Get started with Lawyer Zone today! Bellini is a simple WooCommerce compatible theme that makes it easy to build an amazing eCommerce store. Bellini is developed by Atlantis Themes. This theme is shipped with several beautiful layouts for building stylish product pages. Its one-click demo import helps you easily build a stunning website without having to build your pages from the ground up. With its custom homepage template, you can display product categories, latest products, featured products, Google Maps and more. Get started with Bellini today! News Portal is a WordPress magazine theme built for publications, released by Mystery Themes. This theme comes with 5+ widgets that are suitable for organizing a magazine layout in your homepage. The plugin is available to download for free from the official WordPress plugin repository. You can obtain a premium license for $55. The pro version includes features, like one-click demo import tool, tons of layouts, post review, breadcrumbs and a lot more. Its documentation is well organized on Mystery Themes site, so you can quickly walk through every aspect of building an online publication with News Portal. Get started with News Portal today! 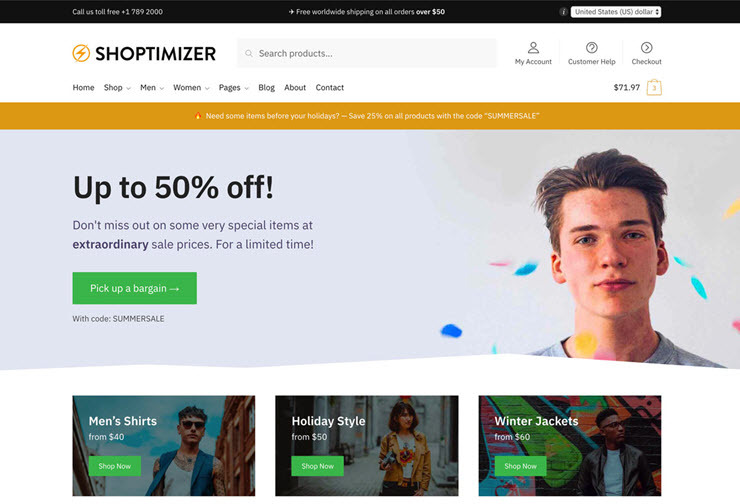 Shoptimizer is a WooCommerce compatible theme, released by CommerceGurus, which is a leading WordPress theme company specialized in WooCommerce optimized themes. With over 10,000 customers, CommerceGurus is one of the best WooCommerce theme vendors in the ThemeForest marketplace. Shoptimizer is built with conversions in mind, so you find a lot of conversion-focused features such as distraction-free checkout page, request a call back feature, sticky product details on scroll and more. All theme settings can be adjusted in the theme customizer. Unlike other CommerceGurus themes, Shoptimizer is exclusively sold on their website, not on the ThemeForest marketplace. Get started with Shoptimizer today! 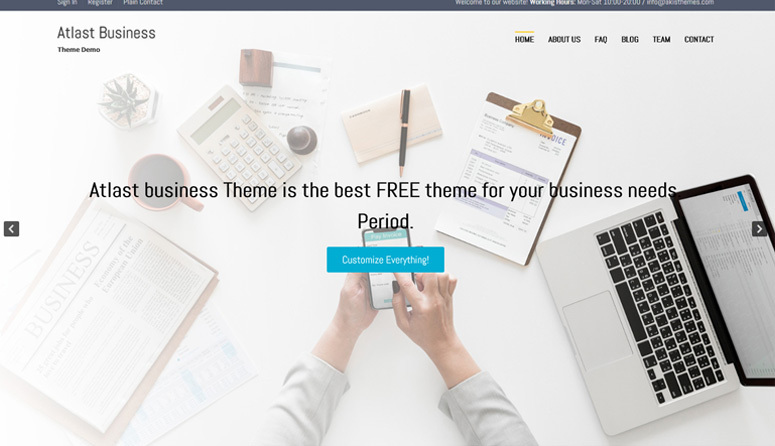 Atlast Business is a free responsive WordPress business theme that you can use to create an elegant website for your business. It comes with tons of customization options and features so that you can create a website with full freedom and creativity. There’re over 70 color picker options to style every part of your site. Besides, it has 3 headers, 3 footers, 3 navigation menus, 4 copyright styles, widgetized areas and much more. You can easily and customize your theme with the Live WordPress customizer without having to touch any code. If you want to add more functionalities, you can install any of the plugins and use with this. 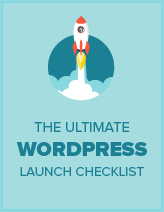 It supports all the major WordPress plugins in the market. Get Started with Atlast Business today! 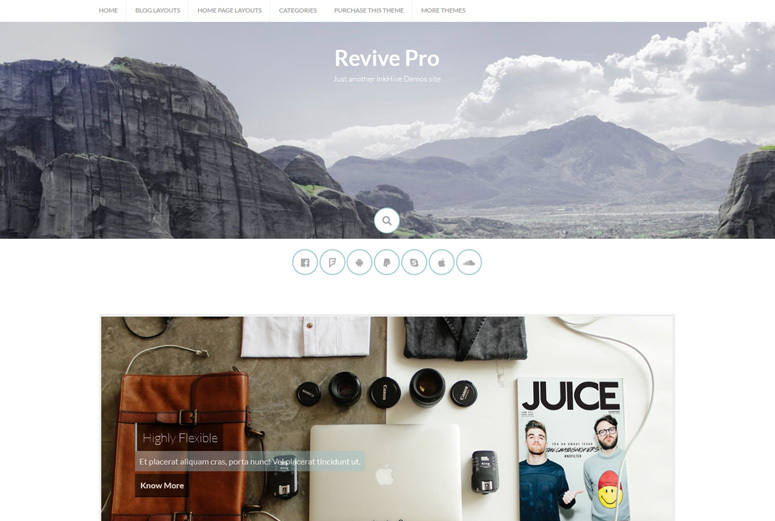 Revive is a free WordPress theme for blogs and online magazines created by InkHive. It comes with a clean and beautiful magazine layout with plenty of styles to show your news and articles. It’s optimized for best speed and SEO. In addition, the theme features a responsive and mobile-friendly layout that looks great on all types of devices and screens. Moreover, it provides you with plenty of useful features like social media icons, multiple header layouts, multiple blog layouts, custom widgets. Sidebar options, and more. The theme is fully compatible for WooCommerece plugin that helps you to turn your webpage into an eCommerce store. Get Started with Revive today! If you’re looking for a pure eCommerce theme to build an online store of your own, Store may be the right theme for you. It’s a fully WooCommerce powered theme by InkHive. Store theme comes with powerful eCommerce options and plenty of customization possibilities. Hence you can create a fully functional eCommerce store using this theme. Some of its features include multiple site layouts, featured product showcase areas, configurable sidebar and 3D effects. The theme is localization ready so you can also create a store in your local language for your local customers. Get Started with Store today! 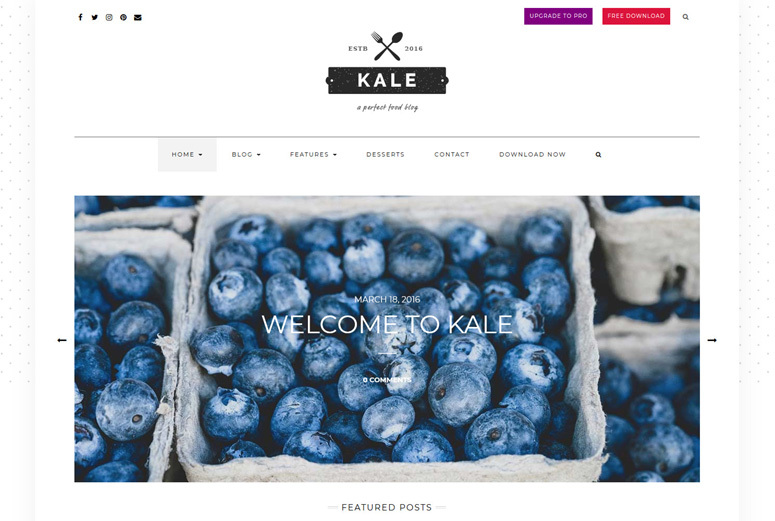 Kale is one of the most loved free themes in the official WordPress theme repository. It has 5 out of 5 stars average user ratings. The theme is created by LyraThemes. Kale is an aesthetically beautiful theme perfect for lifestyle, personal, food and recipe blogs. Designed with love and precision, it provides you with a really amazing blog template. Besides, you can find lots of options to customize your site. Some of its main features are front page featured posts, front page highlight post, multiple blog feed displays, multiple sidebars, sliders and easy social media menus. It’s fully responsive and ready for mobile devices. Inspired by the classic Shakespearean character ‘Juliet’, Juliet is a gorgeous feminine blog theme by LyraThemes. 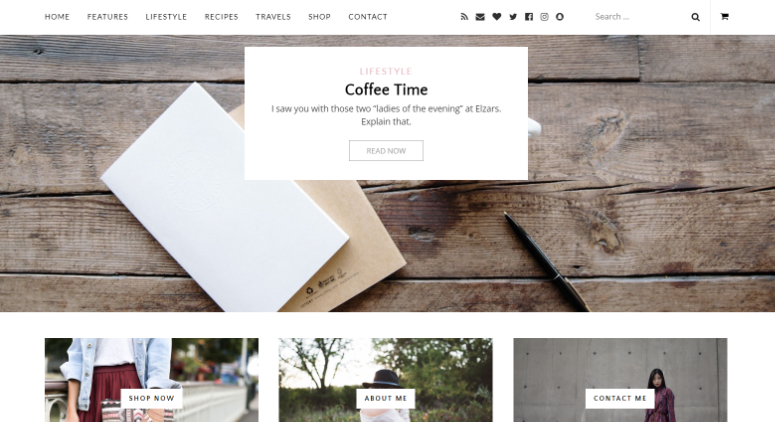 Simple and elegant in design, it’s a perfect theme for lifestyle, beauty, and fashion blogs. Juliet theme comes bundled with lots of styles and options to let you build a dreamy blog of your own. It features fancy scrollbar, sticky posts, off-canvas menu, front page banner, multiple blog feed displays etc. Also, the theme has a deep level of WooCommerce integration to allow you to create a shop page in your blog. It lets you easily add eCommerce features and customize. Get Started with Juliet today! 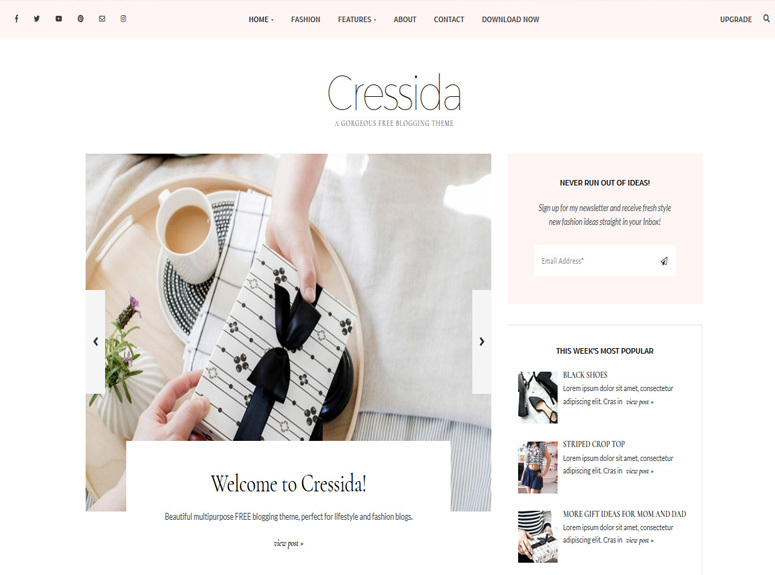 Cressida is a simple and elegant theme for personal blogs as well as professional blogs. It comes with a beautiful design and powerful features that help you to create a feature-rich modern blog with video posts. It’s a creation of LyraThemes. With Cressida, you can get plenty of options to make your front page attractive. It has featured posts, highlight post, promo category, posts strip, featured pages etc. for your blog’s front page. Besides, you can easily customize your blog icons and backgrounds. Moreover, it has plenty of customization options such as multiple widgets, sidebar banner, and sliders, easy social media menus, etc. Get Started with Cressida today! 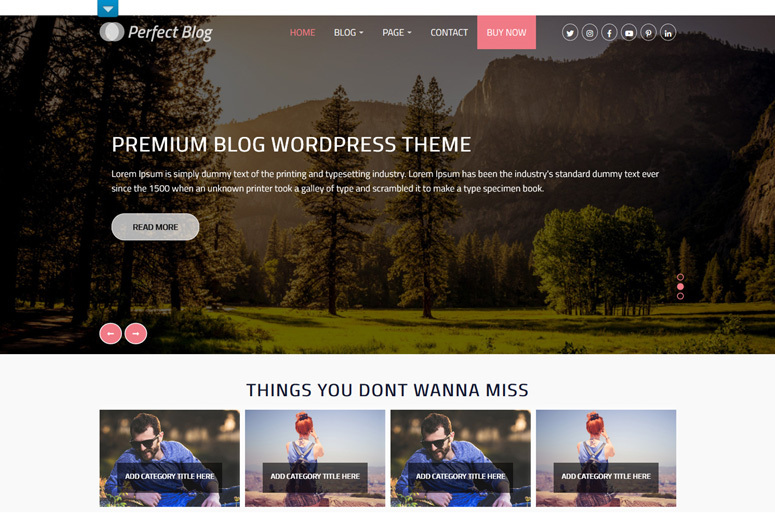 Perfect Blog is a free WordPress blog theme created by ThemeShopy. You can use this theme for blogs, online newspapers, and sports magazines. The theme offers an attractive unique style layout to help you create a professional blog of your own. Perfect Blog theme is perfectly optimized for search engines so that your blog will get better rankings on search results. Plus, it has a high standard of coding to ensure robust security and high-speed performance. With Perfect Blog, you can enjoy fully responsive design, homepage templates, WooCommerce support, logo upload option, slides, etc. Get Started with Perfect Blog today! If you love taking photographs as a hobby or want to become a professional photographer, you can pursue your dream by creating a photography website. With a well-designed photography site, you can showcase your beautiful photos online to a wider audience. 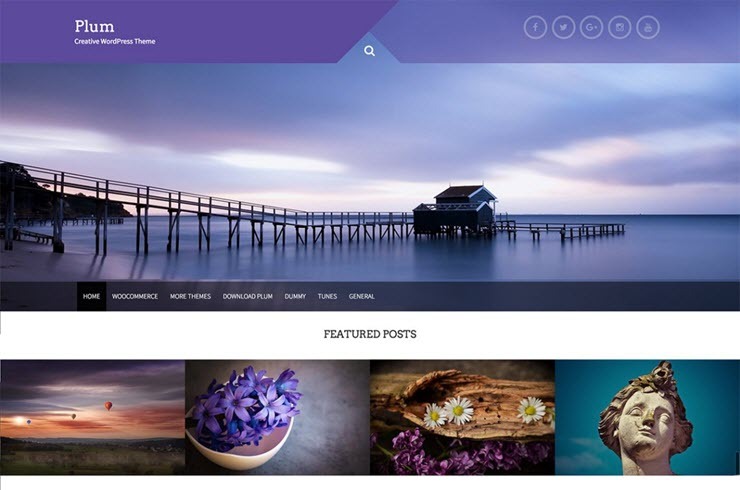 TS Photography is a free theme that you can use to create a beautiful photography site. The theme comes with a fully responsive design so that your photos will look great on all devices. You can upload a custom logo, add social media links, add sliders, and create a unique site with this theme. Besides, you can also sell your premium photographs by creating a shop page in your site as it has full WooCommerce plugin support. Get Started with TS Photography today! BB Wedding Bliss is a free WordPress theme for wedding sites. It’s perfect for marriage, engagement, wedding planners, wedding bands, and couples. However, you can use the theme also for multi-purpose business sites. BB Wedding Bliss theme comes with a fully responsive design that makes your site adaptable to any size and type of screen. To help you create a site with ease, it comes with a ready-made homepage template which you can use with minimal customization. Besides, it features social sharing options, blog layout, sliders, contact us page, etc. 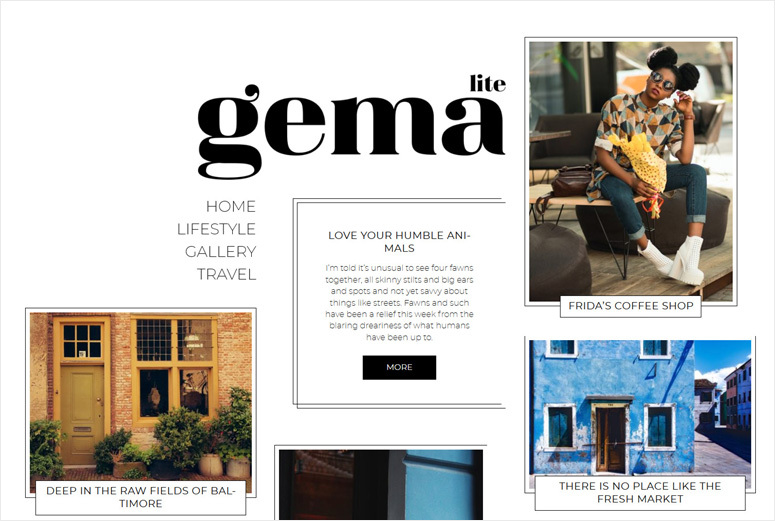 Gema is a modern newspaper style free theme by Pixelgrade. It has a unique and attractive layout that helps you to present your content in ways that grab your site visitors’ attention and interest. The theme is great of for travel bloggers, photographers, literary writers, as well as personal bloggers. Gema features bold masonry style design which makes your post thumbnails look great regardless of their dimensions and size. It’s basically a bold theme with a minimalist look, no clutter at all. So, it’s a great choice for bold people. Moreover, it has a fully unique way of displaying categories and posts. This theme is a great choice for those looking for an experimental design. Hive is yet another amazing theme by Pixelgrade. It’s an effortless tool for publishers of all kind who want to publish articles, quotes, photos, stories etc. Hive offers a great website layout where you can publish anything, yet everything will look great. 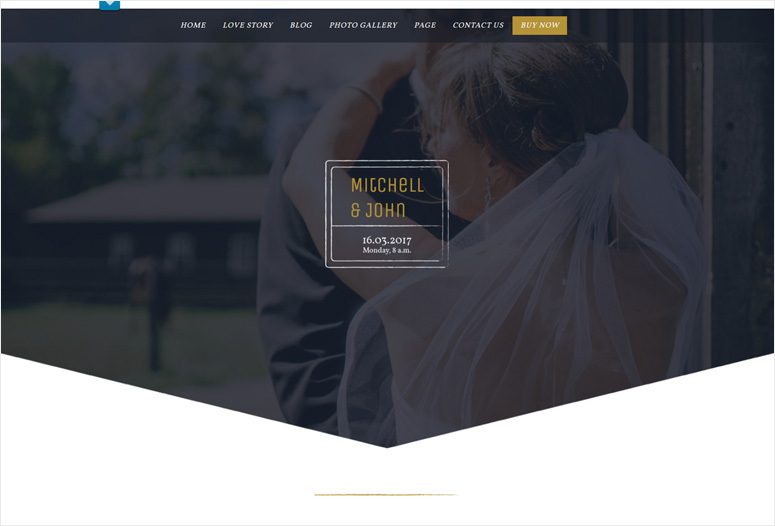 Hive theme has clean masonry-style layout and modern typography along with great flexibility. 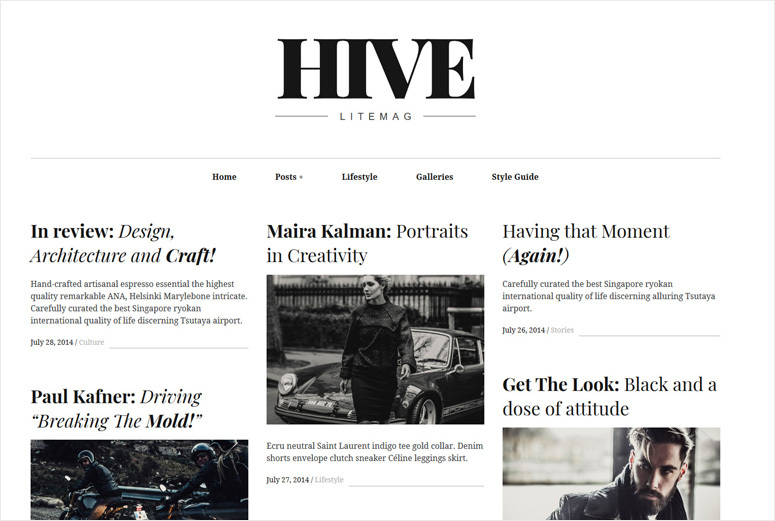 If you love bold and stylish web fonts, the Hive theme has all of them. It’s fully responsive and mobile-ready. Your site will look stunning on normal screens as well as retina displays. Get Started with Hive today! 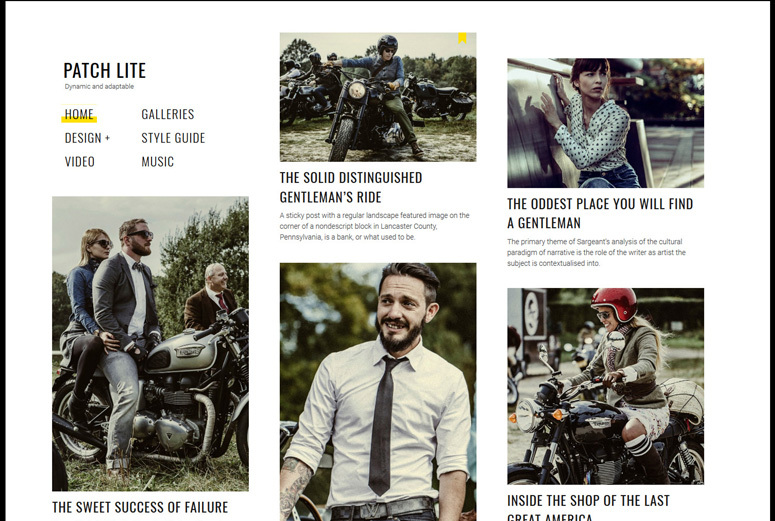 Patch is a magazine-style free WordPress theme by Pixelgrade. It’s a modern masonry-style theme that’s both beautiful as well as user-friendly. The theme makes it easy for beginners to publish content. The theme is fully optimized for SEO and speed. So, you can concentrate your attention on creating great content. Patch is fully responsive and retina ready so the images and content will automatically adapt to any type of screen your readers use to browse your site. Get Started with Patch today! EightyDays is a feature-rich WordPress blog theme that you can use to create a professional blog. The theme is created by GretaThemes. 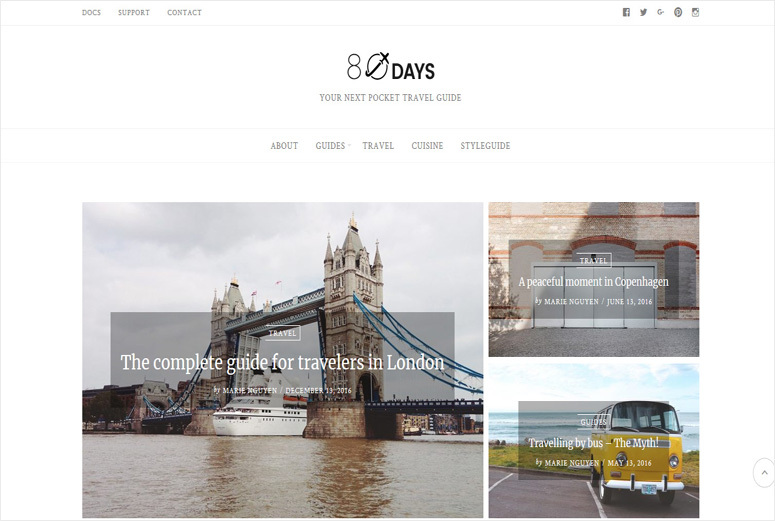 EightyDays theme features a tiled gallery, Instagram integration, and lots of amazing features so that you can use it for multiple types of blogs. With EightyDays, you can enjoy one-click demo import option that makes it easy and quick to start a blog of your own. Once you import the demo data, you can simply replace the demo content with your custom content and publish your site. It’s especially helpful for newbies. Besides, it has other great features including featured content, infinite scroll, 800+ Google fonts, related posts etc. Get Started with EightyDays today! TheFour is a powerful WordPress business theme created by GretaThemes. The theme comes with tons of customization options and powerful features so that you can also create a portfolio and blog sites using this theme. It has a clean and attractive layout that’s tested for responsiveness. The theme is easy to set up and customize, so anyone can build a professional site using this theme. With TheFour theme, you can create testimonials, portfolio, and get more business deals from partners. Besides, it has full integration to Jetpack plugin so infinite scroll, related posts are at your hands. Get Started with TheFour today! If you’re into lifestyle or fashion blogging, then Didi is the theme for you. Specifically designed with bloggers in mind, Didi puts a spotlight on your content and makes it stand out in a truly beautiful way. Featuring a sleek layout and gorgeous typography, Didi is modern and minimalist in the best ways. 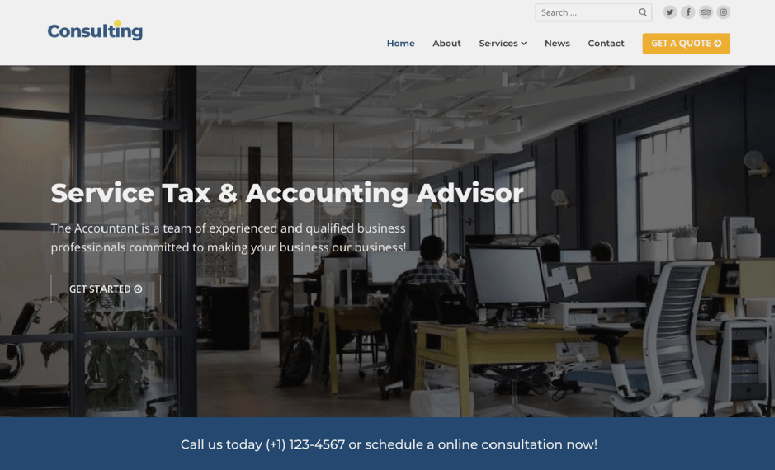 The Didi theme includes necessary features such as related posts, newsletter signup forms, and an integrated and customizable footer widget area, while steering clear of excess bloat. With several pre-designed homepage layouts, Didi is simple to get up and running as a live site. Didi is also fully responsive and looks stunning on any device or browser. Get Started with Didi Today! Downloaded over 30,000 times, Lakshmi is quickly becoming one of the most popular themes of 2019. This unique theme comes with 9 different, easily-customizable, layouts that can serve a variety of websites. Lakshmi features an easy-to-use page builder that makes customization a breeze. It’s also WooCommerce-ready, so setting up an online store is simple. Get Started with Lakshmi Today! FoodyPro was built for food bloggers! 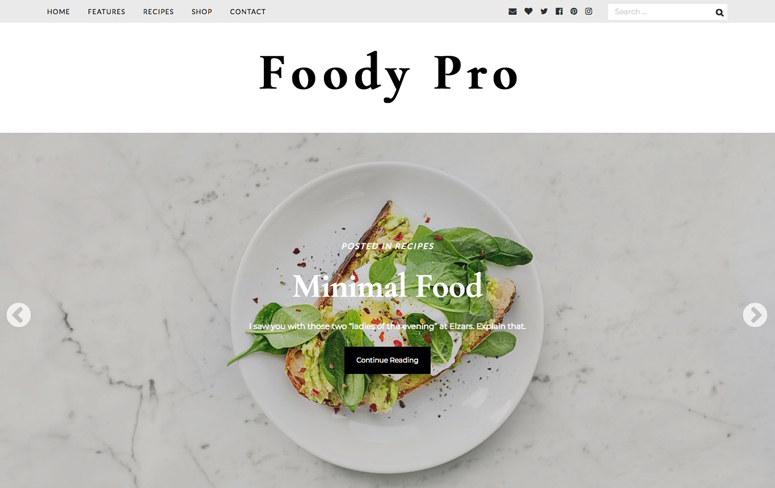 With this simple theme, you can quickly and easily create a food blog and a WooCommerce storefront. Speedy response times, SEO optimization, and mobile friendliness are all features of FoodyPro. It’s also translation-ready and has a recipe index with a custom widgets area for filters. With its 1-click installation, setup couldn’t be easier. It’s every food blogger’s dream come true. Get Started with FoodyPro Today! Whether you’re starting a magazine, news website, or blog, the Infinity Mag theme is a great choice. Modern and clean with its design, Infinity Mag is completely responsive and looks perfect on any device or browser. You can choose between a site-wide or boxed layout, and pick your sidebar positions. Infinity Mag also includes a featured posts carousel and custom widgets to make your site unique. Not to mention the theme is SEO-friendly, and you’ll be able to utilize ThemeInWP’s outstanding support teams. Get Started with Infinity Mag Today! Customify, as the name implies, is a highly-customizable, ultra-flexible, WordPress theme. With dozens of pre-made sites available and ready-to-import, you can have your website up-and-running in mere minutes! Built with page builders in mind, you can use any page building plugin you desire to edit your website to perfection. And, by utilizing the WordPress customizer, you’ll have unlimited typography settings to play around with. Responsive, lightweight, and speedy, the Customify theme is SEO optimized and comes with personalized e-mail support. Get Started with Customify Today! Fruitful is a free minimalist responsive WordPress theme that comes with a powerful theme options panel. Fruitful is built by a top Ukranian WordPress development company called Fruitful Code. The Fruitful theme allows you to choose between responsive and fixed HTML layouts. You can also choose between 3 different layout types such as full width, right sidebar and left sidebar. The fruitful theme is bundled with 25 widgets, including 12 standard WP widgets (such as Archives, Categories, Text, etc. ), 12 WooCommerce widgets (like Average Rating Filter, Product Search, Top Rated Product) and 1 Fruitful widget: News Archive. Get started with Fruitful today! 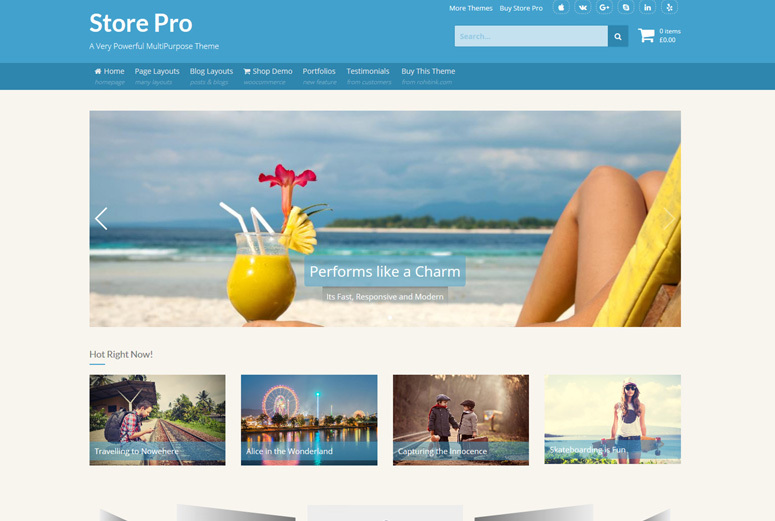 Travel Way is a responsive WordPress theme built for travel agencies and tour operators. It comes bundled with 9+ custom widgets that can be used on homepage and sidebar. Travel Way is also compatible with the drag and drop SiteOrigin Page Builder. Unlimited Slider: Without a dedicated slider plugin, you can build stunning WordPress sliders with ease. One-click demo import: With a single click, you can build a website just like their demo site. Layout controls: Travel Way allows you to set up your sidebar on left or right. You can even choose a full-width content area without any sidebar. WP Diary is a perfect WordPress theme for news magazines, journals or personal blogs. It’s developed by MysteryThemes, a popular WordPress theme hub. 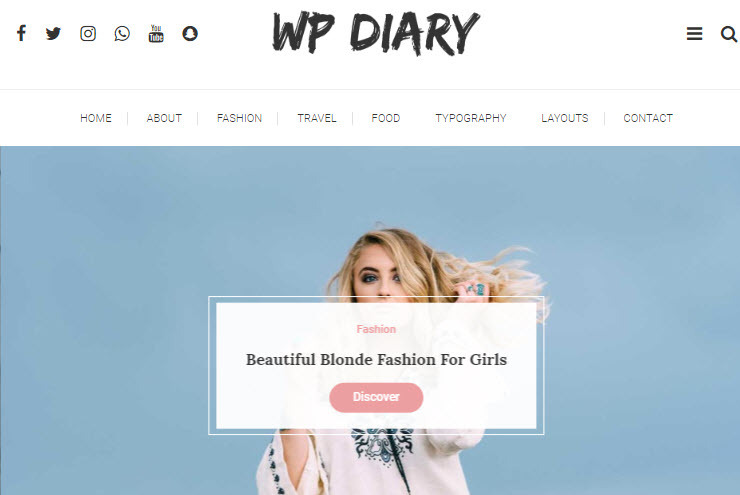 The WP Diary theme comes with dozens of customization options to tweak your website the way you want. All customization options can be adjusted using the Customizer, so you can preview and modify your theme’s appearance. They offer customer support via forums on their website. Get started with WP Diary today! Moroseta is yet another minimalistic WordPress theme, created by PanKogut. Out of the box, Moroseta lets you build beautiful sliders for featured posts on your homepage. In addition, you can also display a promo box on your homepage and other pages. The blog page comes with 5 layouts, so you can give a unique appearance to your blog articles. Header and footer option with the ability to add social icons. Get started with Moroseta today! 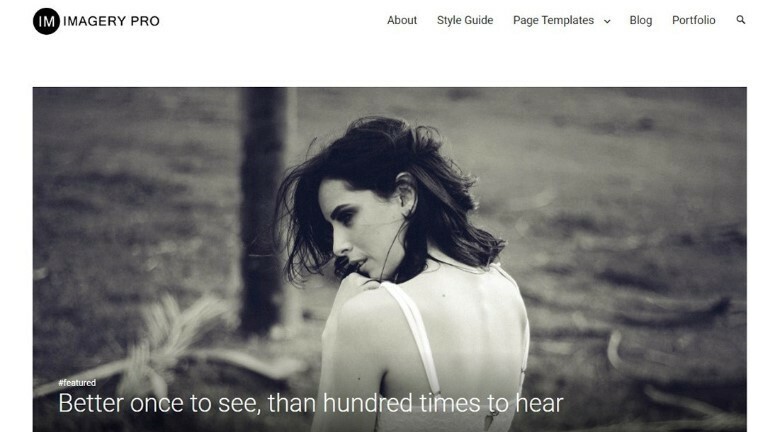 Mesmerize is a multi-purpose WordPress theme, developed by Extend Themes. Mesmerize lets you build a unique website with drag and drop. The free version of the Mesmerize theme comes with a pre-designed home page, along with 5 header designs and over 30 customizable content sections. With the premium version, you’ll get 100+ predesigned blocks to build a stunning website in no time. Best of all, it allows you to edit the live content using the Customizer. Mesmerize offers 3 premium plans, starting at $79. 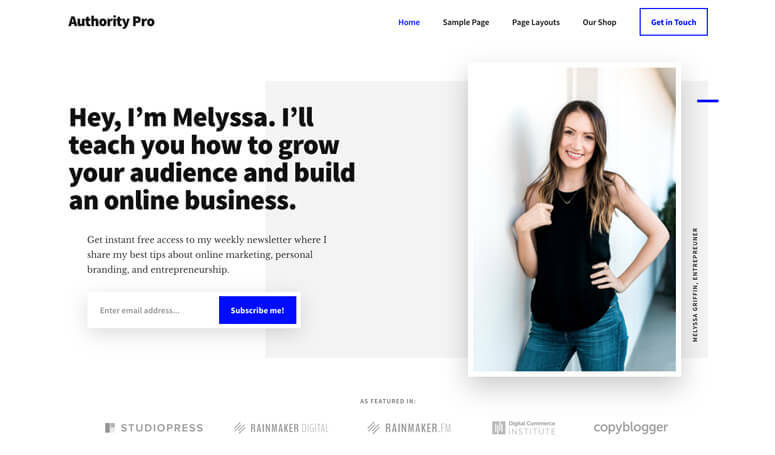 If you’re looking for a highly customizable WordPress theme that lets you edit your content using the Customizer, then we highly recommend you using Mesmerize. Writings is a Gutenberg compatible WordPress theme, built for writers and professional bloggers. Since Writings works seamlessly with Gutenberg, you can use blocks to create all types of content. You can download a free / lite version of the theme from the WordPress repository. 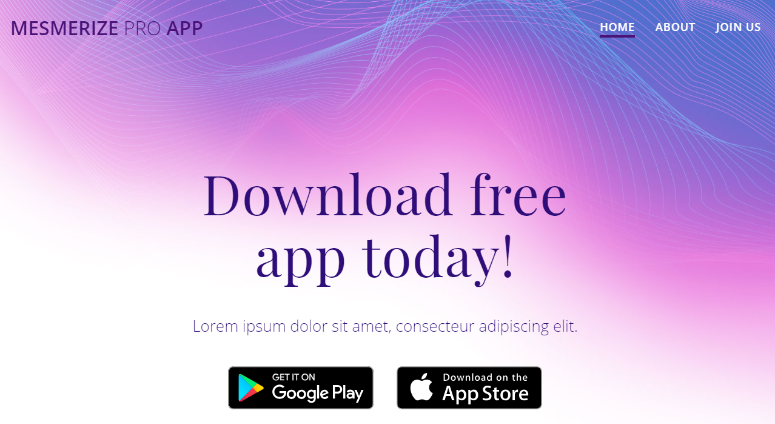 The premium version comes with enhanced features, including bottom widget area, 3 additional page templates, 2 homepage content layouts and more. Writings is also compatible with the Atomic Blocks plugin that extends Gutenberg block set. Get started with Writings today! 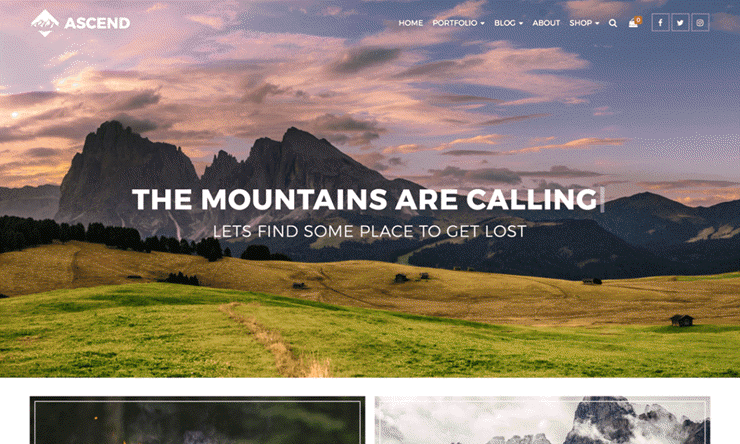 Imagery is a minimalistic WordPress theme built by Dinev Themes. Imagery also supports plugins such as Atomic Blocks and Stackable that extend Gutenberg editor block set. This theme comes with a no-sidebar layout with the featured image or gallery slideshow at the top. The frontend comprises several sections, such as featured content, page content, latest posts section, and portfolio section. You can manage these sections in the Customizer. Get started with Imagery today! TC E-commerce Shop is a free WordPress theme built for running an eCommerce shop. This theme is built by Themes Caliber, a team that sells world class responsive themes. Both free and premium version of the TC E-commerce Shop theme is available. The free version allows you to showcase your social media profiles, upload logo and helps you create sliders. The premium version comes with 3 different blog layouts, 2 page layouts and more. Total is a multipurpose WordPress theme that comes packaged with tons of features out of the box. Total helps you customize your WordPress website the way you want via WordPress Customizer. A free / lite version is available to download on the WordPress repository. If you want enhanced features like one-click demo import, cookies consent for GDPR compliance, mega menu, multiple header layouts and more, you can install the pro version of the theme. We hope this article helped you find the best WordPress theme for your site. You may also want to check out our hand-picked list of the 27 best WordPress plugins that you must have!